We often hear about the benefits of Yoga for relieving stress from our busy lives. What we may not think about as often is that stress can also affect our children -- they can benefit from Yoga practice as well! Yoga can help children of all ages and body types learn to correctly stretch, breathe deeply, relax and concentrate. What are some good yoga poses for kids? This week's video shows you five kid friendly moves to get your future yogi or yogini started. Remove your shoes, and sit upright either in a chair or on the floor. Close your eyes, take deep breaths, inhaling and exhaling, and think of a place that makes you feel relaxed and happy. Picture your stomach as a balloon that you want to slowly fill with air, then deflate slowly. Mountains are tall, still and quiet, so you should try and be the same during this pose. Begin by standing with feet slightly apart, toes forward. Lift your shoulders up, back a little and down. Move your arms away from your body just a bit, fingers stretching down. Close your eyes and remember to keep breathing deeply. Stand with your legs slightly apart and bring your hands together to form a trunk. Raise your “trunk” high overhead. Now reach your trunk in front of you as if you were trying to reach for a bush on the opposite side of the room, bending at the hips. Now bring your trunk all the way down in front, allowing your head and neck to relax. Gently swing your trunk back and forth. Now slowly lift your trunk one more time high overhead. Release your arms and bring them down to your sides, shaking them gently. Close your eyes and take a deep breath. Start in mountain pose. Lift one foot and hold your ankle. Then place your foot on the inside of your standing leg as high as you can. Pretend that your standing leg is the trunk of a tree and that your foot has roots that go down through the ground. Now if you can, grow your branches up to the sky. Keep your hands together or spread your branches out and move your leaves in the breeze. Lower your arms and stand in mountain pose again. Do the same move on the other foot. Lie down on your back on the floor and relax with your eyes closed, continuing your deep breathing. Try to imaging floating on a cloud. Practice relaxing each part of the body one at at time, beginning with the feet, and moving upwards until you reach the top of the head. Once relaxation time is completed, slowly start wiggling your fingers and toes, then other parts of the body slowly, coming back up to a seating position when you feel you are ready. Sign up HERE to to book a private class with Krista for you and your family. We also offer group online yoga classes for kids! Purchase the recording of last month's live class OR sign up to attend LIVE this month. More info HERE. 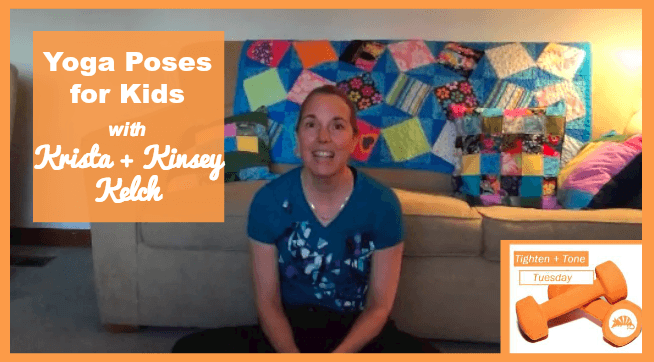 Kinsey is a very active fifth grader. She loves school, likes to hang out with her sister and brother, likes to play sports, and likes to run in races (she's completed a few 5K's and one Disney Kids Race). She also loves crafts and doing puzzles -- her mom has seen her complete a 1000 piece puzzle in a couple of days!